I’m 26 and live in Portland, Oregon (land of the hipster). Most of my stylish compatriots are wearing oversized sweaters trapeze-style tee shirts with leggings or skinny jeans. That works great on I shapes, but not so much for me, an 8 shape. The problem is, most of the styles that work for the 8 also seem very formal (the peplum jacket, for one). Do you have any tips on interpreting the rules for the 8 into something stylish, casual, and unfussy? 1. Choose soft fabric that drapes, skims without clinging for casual looks. 2. 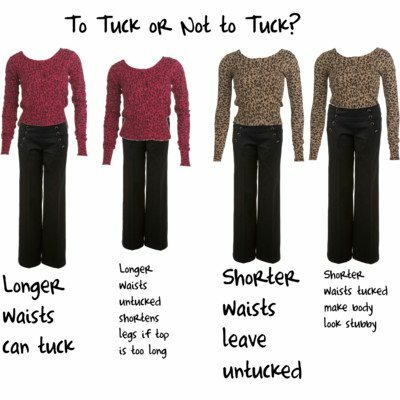 Choose garments that either have waist shaping built in, or ones you can belt to draw in the excess fabric to flatter your waist. 3. 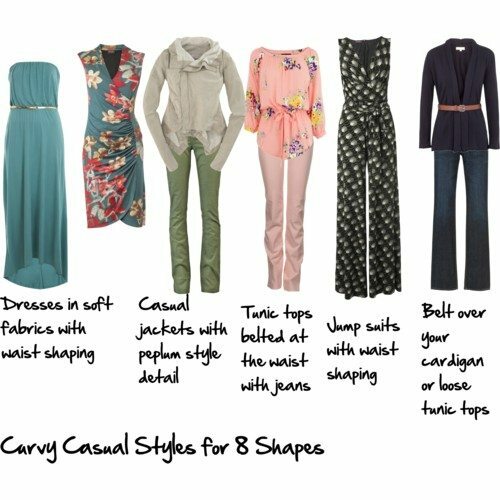 Look for garments that work with the 8 Shape rules, but in more casual fabrics – the jacket I’ve selected here has a peplum style hem, but is in a casual style and fabrication. 4. Think about using a column of colour to elongate, with more tapered styles to flatter. To make straighter shapes more casual think cotton based fabrics, denim, drill, jersey. Keep accessories more relaxed and chunky rather than fine and refined. 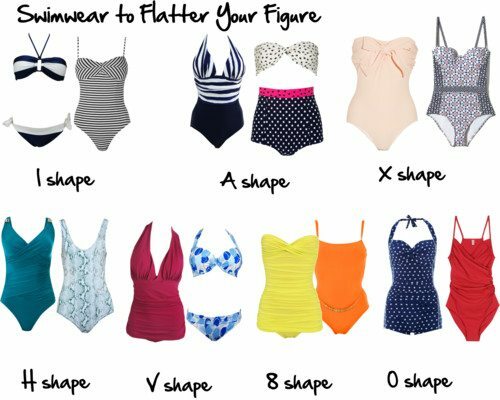 More 8 Shape tips and what to avoid as an 8 shape. Thanks Aileen – as you’re an 8 it’s great to get your feedback! I am so glad someone asked this question! I am actually an X, but I have been wondering how to dress casually for some time. 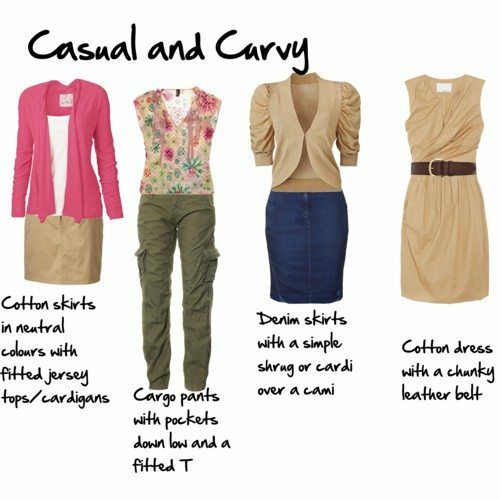 I often feel overdressed because I have difficulty finding casual clothes that don’t make me look frumpy. I think this post is great! Also, I have been wondering about the belted tunic tops. I am an X with a shorter waist (my chest is a bit low), and I feel like I still look bulky even if I belt tunic tops. Is that just me? Maybe it’s a short waist thing? A low hip belt will work much better for you than a waist belt if you have a really short waist. That will bring in the volume of the tunic. 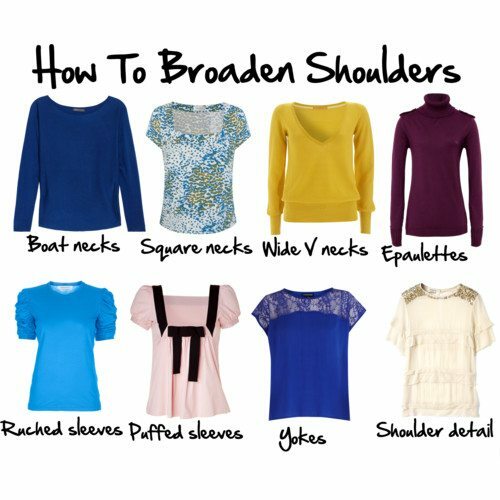 Make sure your bras fit well and the straps are tightened too! thanks for a very timely post! I’ve been lurking on your site, soaking up your advice. As an X, I’m thrilled to see this post as I’ve been searching for something just like this! One more question though. Could an X wear skinny jeans with a tunic if it’s belted? I always shy away from the look as it makes me feel top-heavy (slim, D-cup). 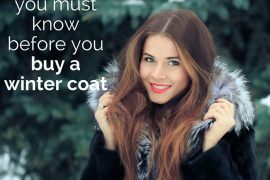 Tonia – depends on the shape of the tunic – also, what shoes do you wear it with? Boots will give you a more balanced look. I like adding ballerinas to skinnies as I feel boots are too hot/heavy for (late) Spring. However, I’ve been seeing lots of low boots in stores which have a summery feel to them. Will those balance out the look too? Thank you so much for posting these! Like Enna, I’m surrounded by friends in cute outfits with leggings! The only way I’ve found to wear them as an 8 is with a flowy, belted tunic. Otherwise, the leggings tend to bunch or gather at our high hip shelf, giving the unfortunate appearance of a “spare tire” when really it’s just our hip bones. I always wear leggings with flats with a low vamp. Ankle boots are cute, but tend to make me look chunky – again, because of that high hip shelf. The low vamp flats really make my legs look longer and thinner. I’ve also found cargo pants very flattering. The chunky side pockets seem to balance out the hips and make my waist look smaller. Thank you, thank you, thank you! This is a great springboard–love the top row–that I’ll keep in mind always. Wish I could spring for that Rick Owens jacket…swoon. Thanks for this post. I’m an 8 too, and I was wondering if you could give more tips for wearing jeans/shorts? I work in a very casual office that is way too cold to wear dresses or skirts in. On the other hand, I also like to do outdoorsy things in the summer that are definitely not skirt/dress appropriate.